The love of a handsome green frog can be a difficult thing to get in this world, but a certain pig we all know seems to have found the answer. The key to a frog's heart is smothering him with love he just can't escape from. With a new red dress and hairstyle, there's no way he can resist and even if he tries to run, she still looks classy when she gives him a smack wearing her long white gloves. Pigs do a great deal of things for humans. They give us tons of joy by being cute and adorable for one. Hours can be spent watching these animals interact with each other on a farm and play in the mud. But more importantly pigs are where bacon come from. Now you can become the creator of bacon this Halloween when you wear this adult pig costume! When it comes to farm animals pigs get a bad rap that is filled with mostly untruths. Like the fact that these hogs don't in fact go crazy with their food and "pig out". These taste-loving critters in fact prefer to eat their food slowly and take the time to enjoy it. And when someone says that they are "sweating like a pig" they are not. This is because these animals do not sweat at all and actually like to keep clean if they can. So when you go out as this resident of Old MacDonald's farm you'll know how to act, like a proper gentleman of the barnyard. How would you feel if all of your family and friends got turned into pork chops or brats? You'd probably go a little crazy and might consider a murderous spree, just like this pig has done. This Butcher Pig Costume is a frightening costume for adults to wear. This is one piggie that went 'wee, wee, wee' all the way to the market. Which little piggy is your little one? Is he the one that gets roast beef, or the one that goes to market? Maybe he's the one that snuggles with you all day long? Well, with this adorable Cuddly Piglet Diaper Cover, he'll definitely be the cutest little piggy, no matter what! It's also a quick and easy choice to let your little one get in on the costume fun. Look at the cute little piggy on the farm! 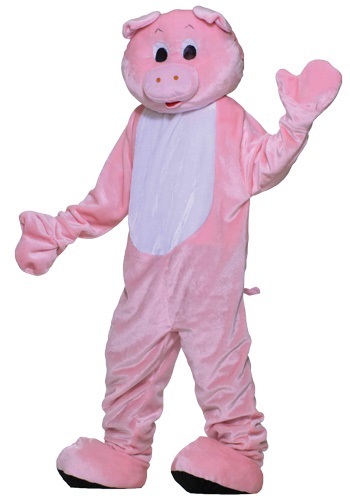 This Deluxe Pig Mascot Costume is great for cheering on your favorite sports team or you can wear it for a Three Little Pigs costume! 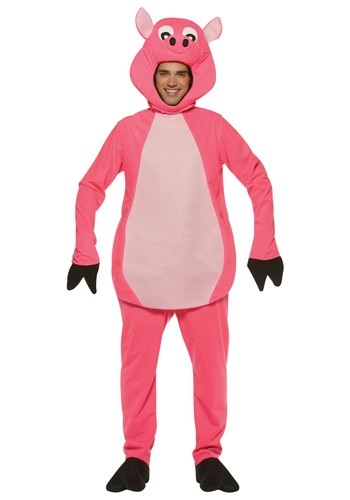 Say 'oink oink' in this delxue pig costume! When you go to a farm you can't help but notice how happy pigs are. These animals really enjoy trotting around the farm while sometimes playing in mud. 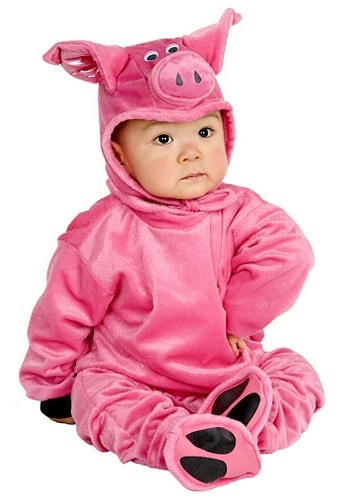 Now your little one can become an adorable pig when they put on this cute costume. This works great for Halloween or for a school play. Your child will love rolling around in the mud--or going to market, staying home, having roast beef, or...--in this Little Pig Costume! It's a great addition to your farm. Do you ever feel like something's missing in your life? Like, there's just something you need to do, but you're not quite sure what it is? 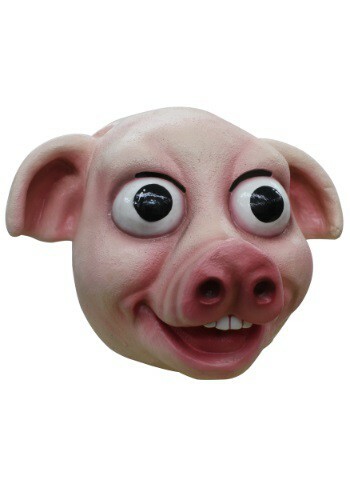 Try wearing this pig mask and acting like a farm animal. It might not be exactly what you were looking fun, but we promise that you'll have a lot of fun doing it. Besides, when you're a giant pig, you don't have to worry about questions like that anyways. Complete your pig costume with this latex pig nose. 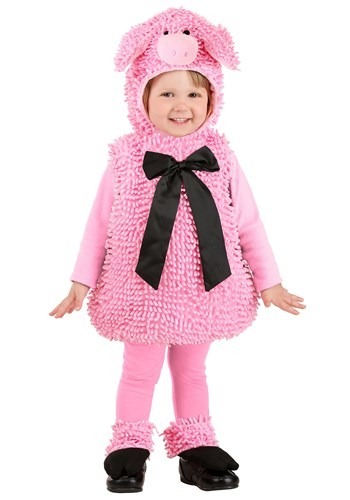 This detailed accessory is inexpensive and will be great for becoming one of the three little pigs this Halloween! Doing a farm theme this Halloween? Then why not go as a pretty pink pig! These lovable little scamps love to play in the mud and have a blast with all the other farm animals. 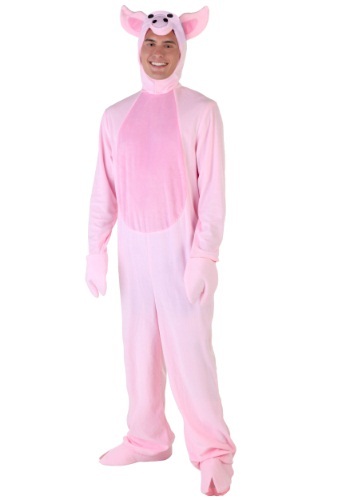 So join Old MacDonald's farm this holiday when you wear this warm, cute costume. Do you know why this silly swine has a huge smile on his face? He just finished going 'wee wee wee' all the way home! This Pudgy Pig is grinning ear to ear because he just got done splashing in the mud or leaving a smelly surprise in the chicken coop. We can't quite put our finger on why, but we can't keep our eyes off of this goofy looking piglet. With an oink, oink here and an oink, oink there. She'll be happily oinking and playing in the mud in this Squiggly Pig Costume! 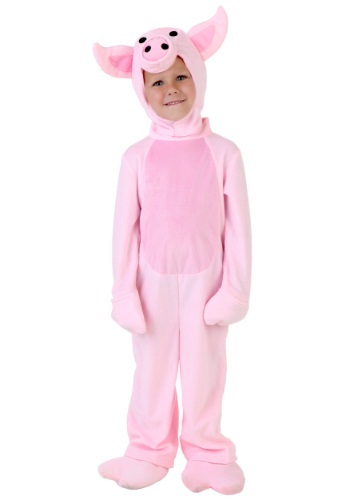 This adorable costume makes a great addition to any farm animal group costume idea too! Who's that little Piggy? 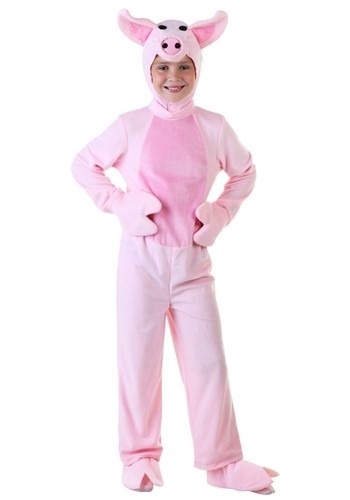 With this adorable Toddler Flora the Piglet Costume, your toddler will be the newest piggy to join the barnyard. Just be glad that the pigpen is your house, and not at the farm. It's much better to have an animal that smells sweet running around! She'll be the star of your get-together, and she's perfect to pair with her friends for a real barnyard party! When you're on a farm you may see an animal playing in the mud and that animal is known as the pig. The wonderful thing about pigs is that they are really cute to look at and hilarious to watch play. Now your tiny tot will have a plays pretending to be on a farm when they wear this Toddler Pig Costume. This is a great costume for Halloween or a school play.